The Morbid Anatomy Museum is a non for profit institution that is "dedicated to the celebration and exhibition of artifacts, histories and ideas which fall between the cracks of high and low culture, death and beauty, and disciplinary divides. 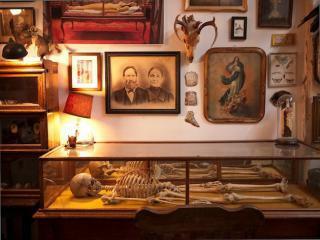 The Morbid Anatomy Museum hosts the kind of temporary exhibitions that very few larger museums can produce; shows both large and small, drawing on private and public collections and calling on the scholarship and expertise of the greater Morbid Anatomy community. Our permanent collection houses a research library of over 1,000 books as well as artifacts such as memorial artworks, medical moulages, wax embryological models, natural history specimens, and a variety of uncanny artworks and artifacts from around the world."